The Open House New York locations won't be released until this weekend, but the identities of some of them are coming out. In this case, the well-oiled Prospect Park publicity machine sent out an email blast announcing that "three of Prospect Park’s architectural treasures, the Litchfield Villa, Lefferts Historic House and the Soldiers and Sailors Memorial Arch, are included in America’s largest architecture and design event: the Annual openhousenewyork Weekend (OHNY), October 6 & 7." This is cool news in that getting up on the Grand Army Plaza is great opportunity and the Litchfield Villa (which was the country house of Gowanus Canal and Park Slope developers Edwin Litchfield) is a beautiful building. There will be two tours of the Villa--which serves as office space for the Parks Department--on Sunday, October 7. They're from 2-3PM and limited to 20 people. The lobby and second floor rotunda will be open to the public on Sunday from 1PM-4PM. The Lefferts Historic House will have three tours, at 11AM Saturday and 10AM and 11AM Sunday. 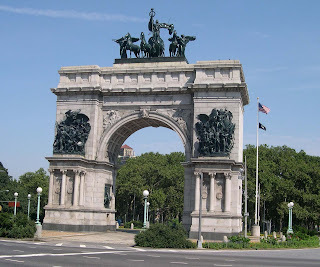 The Arch in Grand Army Plaza will be open on Saturday and Sunday from 10AM-4PM. Guides will take visitors to the top. All the OHNY info can be found here after it's posted on the 28th.